Are Galaxy Note 3 phablet CPU tests phabulous or phabricated? 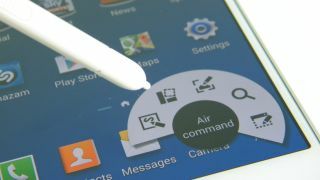 The Samsung Galaxy Note 3 packs a speedy 2.3GHz quad-core processor, but the company is now defending its mega-sized phablet's CPU that has picked up the moniker "phabricated." Samsung stands accused of boosting the CPU performance of its newly launched smartphone as soon as it detects popular benchmark testing apps. That's not the case at all, according to Samsung. "The Galaxy Note 3 maximizes its CPU/GPU frequencies when running features that demand substantial performance," the company told CNET UK. "This was not an attempt to exaggerate particular benchmarking results. We remain committed to providing our customers with the best possible user experience." Samsung's response doesn't exactly explain why tests have shown the Galaxy Note 3 to be running on all four cores whenever it detects a well-known benchmarking app like Geekbench. Benchmarking scores were inflated up to 20%, and in one case 50%, making the Note 3 quad-core processor seem exceptionally faster than the LG G2's identical Snapdragon 800 CPU. When Ars Technica rigged together a renamed Geekbench tool, Stealthbench, the Galaxy Note 3 proved to show a more "natural" score. This isn't the first time Samsung has had to defend itself against boosting the benchmark scores of its devices. The company denied it was rigging the Galaxy S4 results after it reportedly cooked the scores for its Exynos processor. The funny thing is, the Note 3, as with the Galaxy S4, is plenty powerful and feature-packed enough to stand against its rivals. We asked Samsung for further clarification on this and will update the story when we hear back. Update: We have also asked Qualcomm for comment on the situation and will provide an update when the chip maker has something to share. Next thing you know, they'll do something shady and announce a gold Galaxy S4. Oh... wait.